Have you ever dreamt of going to a live concert of your favorite band without queuing for hours outside the venue? Can you imagine watching your favorite soccer team from the stands while ordering refreshments then paying using your face without waiting in line at half time? At IDEMIA, we believe that even the strictest security measures must be convenient and user-friendly. What people could only dream about not so long ago is becoming reality thanks to our technologies. “Home - Digitalize all your transactions”: relax in your couch – your bank account is at your fingertips and securing your transactions has never been so simple. With the ARENA Experience app you can enroll with a quick selfie and fingerprint scan, securely add your credit card and the tickets to the show are yours. “Home - Unleash the power of connectivity”: connectivity gives you a headstart! With eSIM technology, you can connect all your devices in mere minutes ౼ before you get off to the show. Welcome to a truly connected world. “Access - Breeze through the entrance”: get ready for the VIP treatment. From the parking lot to the security check, biometrics let’s you whiz past the crowd. And don’t worry, no one will tamper with that security camera above your head. “Timeout - Pick up refreshments faster than ever”: don’t miss a minute of the show. Cut the line with a wave of the hand or pay with a smile. Thirsty? With your smartphone you can prove your age in total privacy. “Backstage - Ensure everything runs smoothly”: go behind the scenes and see how Artificial Intelligence, Cloud and advanced analytics create a smarter, always connected and safer place. New technologies simplify the ARENA experience, boost connectivity, optimize coverage and constantly adapt to meet the needs of the most demanding fans. IDEMIA has placed trust, personal data privacy, and convenience at the heart of its vision while underpinning its technology with the most natural and authentic ID check there is, namely biometrics. This is what we call Augmented Identity. 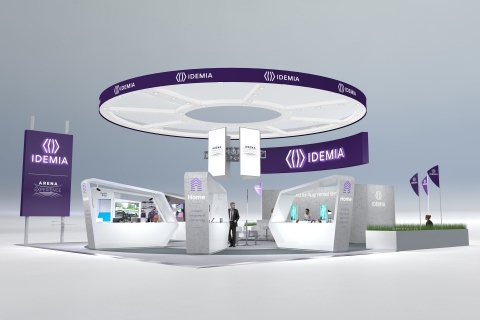 IDEMIA’s CEO Yann Delabrière said: “The Mobile World Congress is a major event for our business and an excellent opportunity to present our new technologies to our clients and partners so that we can identify their needs and expectations. Nowadays, even an everyday experience such as going to a live event can highlight how important everyone’s identity really is in life. Against this backdrop, we bring to market a vast array of innovations involving both the physical and digital space”. to experience the future first hand. Our experts look forward to greeting you!